Brand new live DVD from the US stars. There were some who believed the Creed reunion CD and US tour in 2009, coupled with Myles Kennedy's high profile rehearsal sessions with a certain Page, Jones & Bonham and his confirmed involvement with Slash's live unit, would spell the end of Alter Bridge and this DVD release would become an epitaph to the band's quality 2 album/endless touring history. The fact that album number 3 is now completed and the UK is scheduled to be the first port of call on the next European tour later in 2010, has come as quite a relief to the many fans of the band. 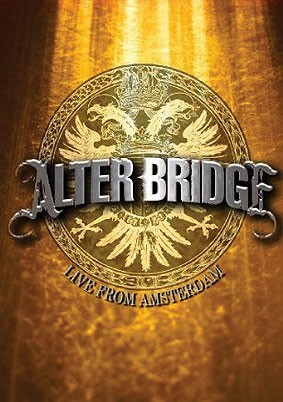 This live show, filmed in Amsterdam during the Winter trek round Europe in 2008, still as part of the promotional jaunt for the 2007 'Blackbird' album, contains, what would seem, some of Alter Bridge's most ardent fans, and the reason for it's selection for filming. Released almost simultaneously as the Live Creed DVD, enticing comparisons which I won't be drawn into in too much detail, Alter Bridge's power and passion is captured in a way that makes one wonder how the other band featuring Messrs Tremonti, Phillips & Marshall could garner more attention....in the USA anyway. I have watched both shows several times now but I will only be returning to one of them on a regular basis. The reason for this is simply down to the ability and talents of each band's lead singer....or, more specifically, the lack thereof. Scott Stapp's limitations fronting the multi platinum Creed are highlighted perfectly in the live environment whereas Kevin Bacon look-alike Myles Kennedy seems totally at ease, as though each and every member of the crowd is a friend, and his performance under the spotlight merely flourishes as a result. The Alter Bridge show is a sensation from the start. Daniel Catullo's edit of the footage, covered by 22 cameras, isn't a dizzy headache inducing sequence of blink and you'll miss ‘em images, allowing lingering shots of the band and crowd to sink in and be savoured. Having previously worked with the likes of Nickelback, Godsmack and the Smashing Pumpkins, his experience clearly has an influential impact on the finished product. Similarly the audio mix by Brian Sperber is both powerful and clear, a comment that couldn't be applied to the last Alter Bridge show I witnessed in person at the Manchester Apollo during the same tour.... anyone with DTS capabilities can share the show with their neighbours without even asking them to come into the house! Scott Phillips literally batters his drumkit whilst bass player Brian Marshall holds things down with an uncompromising yet reserved certainty. Mark Tremonti's tortured facial expressions accompany every flurry of notes or barrage of riffs and his standing as a guitar hero is, as usual, underrated. Kennedy has the audience in the palm of his hand and though not the most flamboyant of frontmen his powerfully mesmerising and passionate vocal performance is a breathtaking addition to his role as rhythm guitarist. The set concentrates heavily on the 'Blackbird' release and cherry picks the best tracks from the debut. The first half batters the senses and the pace only really relents for the first time during Kennedy's poignant acoustic rendition of 'Watch Over You', his vocals, with just a guitar and the crowd to accompany him induces several hairs on the back of my neck to stand to attention. The version of 'Coming Home' is obviously heartfelt and relevant whilst both 'White Knuckles' and 'Buried Alive' bruise the senses throughout their urgent audio and visual attack. Kennedy puts his guitar down for the first time during 'One Day Remains', a segment that also features a camera attached to Tremonti's head stock to catch his nimble finger work and a technician appearing from the wings to augment the sound as second guitarist. Highlights of the show have to be the emotional roller-coaster that is the song 'Blackbird' followed immediately by my favourite AB song, the touchingly melancholic 'In Loving Memory', written by Tremonti after the death of his mother. Both songs will leave you physically and mentally drained and it is clear the emotional intensity generated affects both band and crowd alike as the camera lingers on Tremonti's face at regular intervals. With no flashy stage gimmicks or intricate lighting we're left with what Alter Bridge are all about....the songs. One of the best pure music DVDs I've seen for a while and though the 95 minute running time might seem a little lean, especially as this Region 1 version of the disc contains no extras (a deluxe edition was planned) and is actually a little pricey, when the main feature is this good those little criticisms seem irrelevant.